In “The Coincidence of Coconut Cake,” Chef Lou Johnson is living her dream at her restaurant, Luella’s, in Milwaukee, Wisconsin. She’s making plans for the future and is engaged to Devlin, a prominent attorney. Life is good and getting better. When Lou bakes a coconut cake for Devlin’s birthday and takes it to his apartment, his intern is there, barely dressed. It appears that Devlin is cheating on her. Devlin is a man who has disapproved of the crocs and casual clothes Lou wears in her everyday chef’s life and buys her expensive dresses because he thinks she doesn’t look after herself. He never understood her need to work/own a restaurant. She has brushed that aside and thought they could work it out, that eventually he would see how important her career is to her. Well, maybe not after the scantily clad gal has made her appearance. Transplanted Brit and food critic, Al Waters, is looking for a way to leave town as quickly as possible, to get away from Milwaukee, Wisconsin – what he considers to be a Podunk region of the world. The restaurant reviews he writes under a pseudonym can ruin an eatery’s reputation, but all Waters wants to do is make a name for himself. His columns are selling newspapers and getting attention from employers, but sometimes play fast and loose with the facts – almost written before he actually eats at the places. Al does a scathing review of Lou’s restaurant on the very night of the intern sighting. Groan. Business drops waaaaay off as a result. Double Groan. Suddenly, life can’t get any worse for Lou. The time is ripe for Lou to completely redo her life. What follows is a series of meetings with both Al and Lou keeping their real identities secret. Deception? Evasion? Attraction? What could go wrong in this tale of love’s beginnings and endings and new beginnings? Amy E. Reichert has written a delightful novel about the way that fate can intervene when life falls off the rails and we are blindsided by events that run contrary to our Grand Plan. The reader is in on the secrets early on, but Reichert’s clever plot keeps us laughing as the main players stay in the dark. 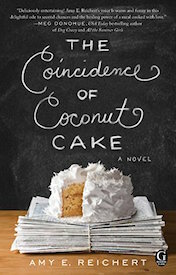 Supporting characters are far from cookie-cutter and have love stories of their own, with the result that “The Coincidence of Coconut Cake” serves up a rich selection from the love menu. While there are no actual recipes in the book, the food descriptions are mouthwatering. Cooks will find a lot to like and may even pick up some tips for food prep. It’s obvious that Al and Lou both love great food as they wander through the Milwaukee eateries and eventually cook for each other. They chat about their families’ influences on their professions, food adventures, and the best way to prepare a dish, with warm and often funny scenes. Their interactions are completely natural and we root for their relationship, despite the complications. Please visit www.amyereichert.com for more information about Amy E. Reichert and her work.